Arctic artists stop time at the Nipirasait: Many Voices: Inuit Prints from Cape Dorset exhibit at the Embassy of Canada in Washington, D.C. 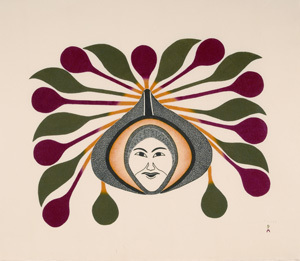 In partnership with St. Lawrence University, a collection of prints from established and emerging artists are displayed to celebrate the 50th anniversary of the Kinngait Studios of Cape Dorset, Nunavut. Just over a thousand miles from the harsh waters of moving sea ice of the North Pole, the Nunavut artists reveal an inter-connectedness between nature, animals and humans with bold lines, colors and perspectives. Rich stories come through each print – be it family, legacies or the strong bonds between man and nature. The contemporary and traditional artists bring forth the mysterious Arctic. As Ohotaq Mikkigak illustrates the interplay between animals, on print is a polar bear who leans into the ice to press his nose against the nose of a grey seal. Is it a moment of hunger or rather a moment of curiosity between animals? Ningeokuluk Teevee captures the legacy of an older owl protecting the young owl within its own frame. One could ask if this overlay symbolizes the spirit owl guiding the younger one. Survival is an obvious theme in each print be it on ice or in the cold crushed ice water. An Inuit mermaid fully dressed in a sealskin coat with a fish tail floats below the surface breathing in an air bubble surrounded by an octopus looking jelly fish. Another print is of a bird delicately curved holding a fish in its beak as though it was holding the squirming fish with chopsticks. Some artists push the edge of tradition and reach forward into a contemporary realm with bold, bright colors and shapes of the familiar. Kenojuak Askevak wrote, “I was thinking of the animals and beautiful flowers that covered our beautiful untouched land.” His fish are brilliant, modern and defies the notion of sourcing. Artists have the opportunity to create new landscapes of understanding. As Mayoreak Ashoona is quoted, “I have tried to put down the onest truth about what it is like to live in the Artic. I have tried to teach about the land and the weather conditions and about what to do inside the house. These are the things I do.” The Inuit artists have perfected the lens into their multidimensional life in the Arctic. The exhibit is on display at The Embassy of Canada in Washington, D.C. until December 30, 2010 at 501 Pennsylvania Avenue, NW, free, open to the public, Monday to Friday, 9 a.m. to 5 p.m. Tags: Artic, Cape Nipirasait, Dorset, Embassy of Canada, Inuit. Bookmark the permalink.